Perhaps our most recurring discussion at record club is about intention and seriousness; how much do artists actually believe in the aesthetic and philosophy (and music) that they’re presenting, and how much are they just doing a job? If one band explodes that discussion completely, it’s The KLF, the unholy duo of Jimmy Cauty (an actual musician) and Bill Drummond (an A&R man, band manager, and artist), The Timelords, The JAMs, The Justified Ancients Of Mu MU; the most committed, irreverent, impassioned, unpredictable band there’s ever been. It’s impossible to ascertain how much they cared about what they were doing and how much they were just taking the piss. It’s also almost impossible to ascertain exactly what they really did do and what they merely pretended to do, or said they did, or lied about, or told someone else to do, or inspired. Their career is such a maze of left-turns, distractions, stunts, and outright lies that it’s easy to forget that they actually made some really awesome music. The White Room was conceived as a film soundtrack, for an ambitious road movie of the same name that never managed to materialise. 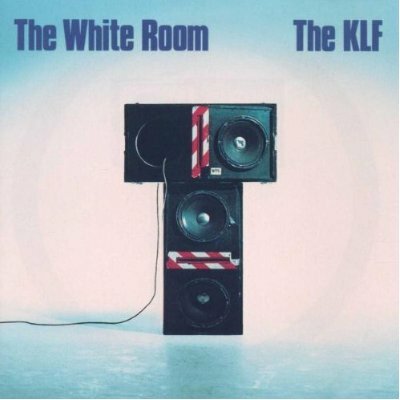 That soundtrack was supposed to come out in 1989, and the album that ended up as The White Room two years later is essentially a potted, corrupted ‘best of The KLF’, jamming their four biggest singles together with a handful of other tracks, recorded with a handful of name session musicians, singers, and rappers, who Cauty and Drummond could afford to hire because of the astonishing success of the Doctorin’ The Tardis single (released as The Timelords). Allmusic list it as the duo’s fourth album, whilst Wikipedia suggests it might be their seventh. Given that The KLF deleted their entire back catalogue when they retired from music in 1992, it’s hard to tell. The only other one I’ve ever heard is Chill Out, an ambient trip through train noises, minimal piano, cows mooing, and more. Scarce details about their other records suggest they were, by and large, opportunistic cash-ins and ragtag compilations of singles, remixes, and corrupted cover versions. I’m sure there must be a way of finding out for sure, but to be honest I like the chaos of not quite knowing. Any which way, The White Room is a lot more than just four “stadium house” hits and some filler; tracks like Make It Rain, Build A Fire, and No More Tears are great (almost minimal techno) tunes in their own right, and those singles, appearing in LP-specific versions that differ from the various other mixes that saw release and airplay, are as enormous and irresistible as you remember them being. Deleted for 20 years (but actually pretty easily available on import), The White Room is a mad classic, and, amazingly, as much fun to listen to as talk about. Tom Listened: Back in the day EVERYONE loved the KLF. Their singles were indeed works of genius and it was impossible not to be won over by Justified and Ancient, 3am Eternal or Last Train to Trancentral. These were great pop tunes, great to dance to, great to watch on Top of the Pops, great to hear on the radio. Even my Mum liked Justified and Ancient (or did I dream that?). But, a bit like De La Soul, I never felt the urge to explore beyond the singles. Unlike Three Feet High and Rising (which Graham’s wife Karen chose for our wife’s night), I thought The White Room was consistently excellent throughout and I enjoyed listening to the tracks I had never heard before as much as the big four singles. I like the fact that The KLF are hard to work out, intriguingly irreverent and, a bit like Todd Rungren on my choice for last meeting, playful and inspired. Their intentions may have been mercenary, their skill as musicians may have been negligible, they may have been taking the piss but when the end result sounds this good, what does it matter? A great record. Rob listened: I file the KLF under ‘Outfits i’m glad exist’. It’s years since I listened to them, possibly not since they were strafing the dancefloors of my student clubbing days. Prior to this evening I would have professed to be more interested in them as a rolling Situationist spectacle than as musicians but listening to the album reminded us what great music they were capable of making. ‘Light a Fire’ in particular stood out, removing the bombast and focussing on the beauty. We spend a great amount of time at DRC discussion whether artists are serious about what they’re doing or not. No point debating this in KLF land, where it’s always 3am. Just dive in. Graham listened: At the time I probably spent a lot of time telling people how much I hated dance bands like KLF and then would promptly finish up ‘largin-it’ on the dancefloor to their tunes every time we went to a nightlclub in my student haunts of Birmingham and Portsmouth. They probably opened up my mind to dance music as a genre I might investigate further. I was never interested in their posturing and publicity stunts, the tunes were good enough by themselves.